On Saturday 2nd March to help celebrate St David’s Day, a team of Hospice Troopers will be rising to the challenge and climbing Pen-y-Fan. A strenuous mountain walk on well-made footpaths. The highest peak in South Wales, Pen-y-Fan stands at 886m (2,907ft) above sea level and overlooks breath taking scenery, rolling countryside and impressive mountains. 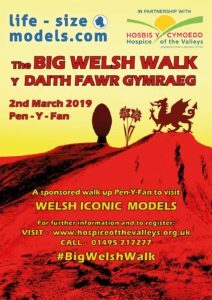 Well this is your chance to walk in the footsteps of some Big Welsh Icons – giant models will also be carried to the summit and will wait your arrival. Thumbs up and have your photo taken with these giant iconic models, be part of an amazing atmosphere and story of how these legends made it to the top of South Wales’ highest mountain. Whilst perfect for friends, families and groups, our little troopers can get involved too. All children and young people aged 17 and younger must be accompanied by a responsible paying adult (18 years+) at all times. If you would like to come on the adventure with us, then view the Terms and Conditions and click on the Walk this way to Register, we’d love to have you on board. Individual entry £5.00 per person. We are looking to raise £4511.00 which equates to the running costs for the Hospice for 1 day – so lets raise the vital funds to pay for St David’s Day at the Hospice.